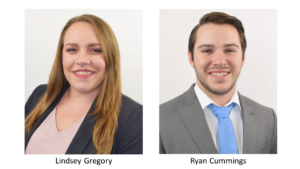 THF welcomes Lindsey Gregory and Ryan Cummings to the firm. Lindsey, a Fort Myers native, received her bachelor’s degree in accounting at Florida State University, followed by her master’s degree in accounting and taxation from Florida Gulf Coast University. Lindsey is in her first year of public accounting. Ryan, originally from Punta Gorda, received his bachelor’s degree in accounting from Pfeiffer University. Ryan is also in his first year of public accounting. Lindsey and Ryan are both members of the Florida Institute of Certified Public Accountants (FICPA) and will be working out of our Tampa office. THF welcomes Ryan Cummings and Lindsey Gregory to the THF team!